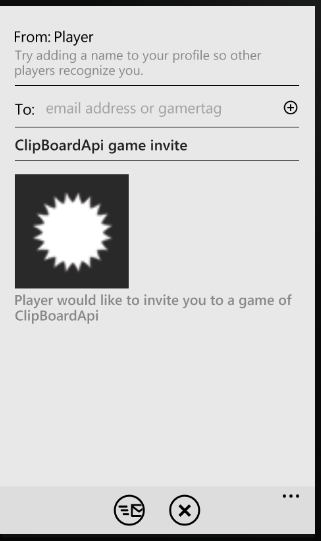 You can send game invite to multiple users in Windows Phone using GameInviteTask chooser. GameInviteTask chooser is used to send invitation to other users in multi-player game. It provides an invite screen to user where they can configure Email address of other users to send game invitation. 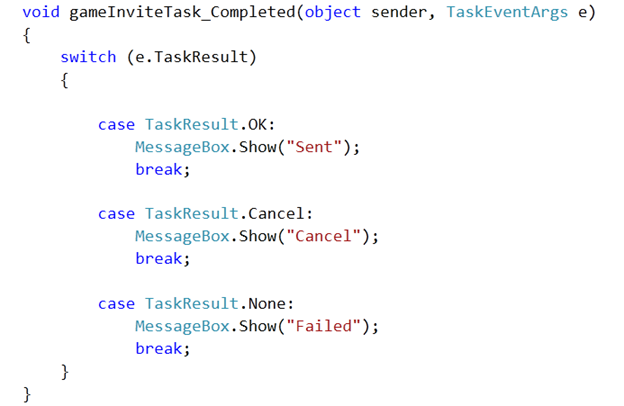 Invitation will be sent by GameInviteTask chooser is in asynchronous manner. GameInviteTask will launch invite screen and when user will complete configuring Email address of other user then complete event will get fired. Next you need to call the show method to launch invite screen application as per your business requirement. It may be on click event of a button. Session Id is string identifying particular network session. On user selection cancel, message will be shown in message box as below. In this way you can send game invitation to multiple users. I hope this post is useful. Thanks for reading.